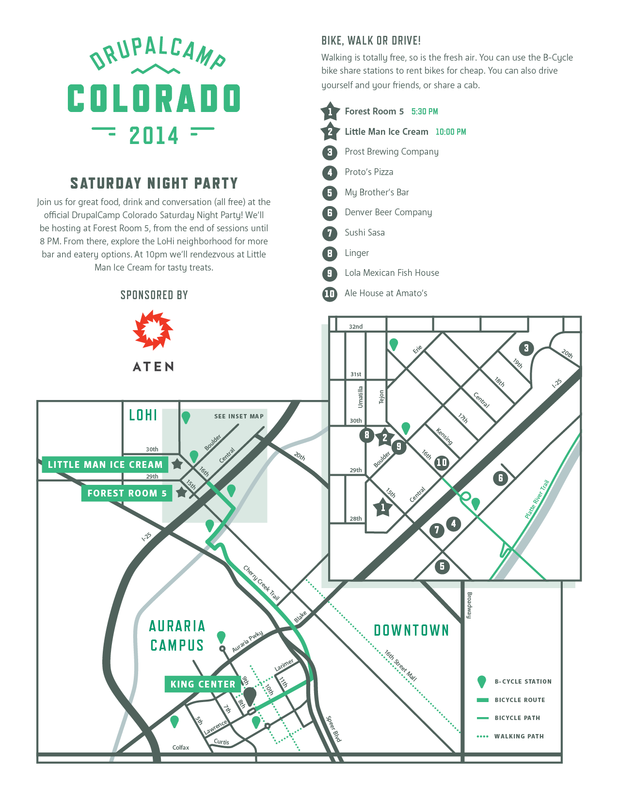 Aten is proud to host the Saturday Night Party for DrupalCamp Colorado this year. Join us at Forest Room 5 from 5:00 to 8:00 PM. We'll provide delicious food and drink so we can all continue the great conversations started earlier in the day. When sessions end, get out and enjoy the fresh air on your way to the venue in Denver's LoHi neighborhood. You can walk or bike on the Cherry Creek bike path, which is just north of campus. Don't have a bike handy? Don't worry. You can rent bikes for cheap at a B-Cycle station one block away from the King Center (the DrupalCamp venue) on the Auraria Campus. There are other stations on and near campus, and several more near Forest Room 5. At 8:00 PM, we will be exploring LoHi for more bar and eatery options. Then at 10:00 PM we’ll rendezvous at Little Man Ice Cream for tasty treats. Look for the giant cream can and hope you've saved room for dessert. For what it's worth, we have provided what we think is the shortest AND most enjoyable bike route from the King Center to Forest Room 5. By default, Google Maps does not handle the pedestrian streets on campus as well as we'd like. However, these directions will get you there too: Google Maps Directions. If you're on a B-Cycle bike, look for the station on Platte St. before crossing over I-25. For directions from other locations, here is Forest Room 5's address.